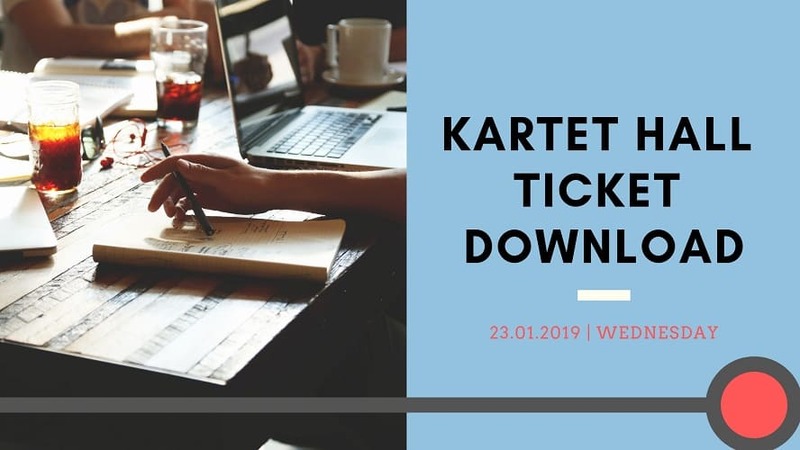 Dear candidates, you can download KARTET Hall Ticket 2019 from direct official link below. Also, Keep your registered phone number & email id active to receive intimation regarding the hall ticket download. For the Teaching Job Seekers in Karnataka State, the TET Exam will be conducted on 03 Feb 2019 (Sunday). The Exam will have two papers viz. Paper I & Paper II. However, applicants need to appear in the exam as per their registration. To download admit card and check hall ticket number, the official website is schooleducation.kar.nic.in. Candidates have to enter the Application Number and Date of Birth for Paper I / Paper II KAR TET Hall Tickets. After the exam is over, one should keep the Karnataka TET Admit Card 2019 safe so that it can be used further to check result as well as merit list details. Those candidates whose Karnataka TET registration was not made successfully cannot get access to admit card as per the instructions. 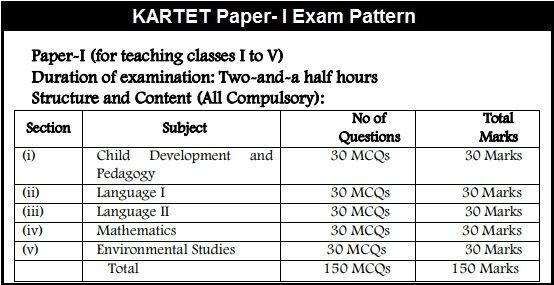 The download details along with KARTET Exam Syllabus are given in below screen. Kindly read it carefully. Candidates appearing for KARTET 2019 can get official access to Karnataka Teacher Eligibility Test Admit Card using this page. Here the information about hall ticket and exam preparation has been updated well in time. The Teaching Job Seekers who are going to appear in TET Paper I / Paper II can download their hall ticket as per the official availability. In the notification, it’s mentioned that candidates can take care of the KARTET Hall Ticket starting from 23 January and exam will be conducted as per the schedule. For the hassle free download of your hall ticket & updates, visit AdmitCardIND.IN. As mentioned, Karnataka TET will comprise Paper I & Paper II for the Teacher’s Eligibility Test. So, the exam pattern for both is given individually in the images below. 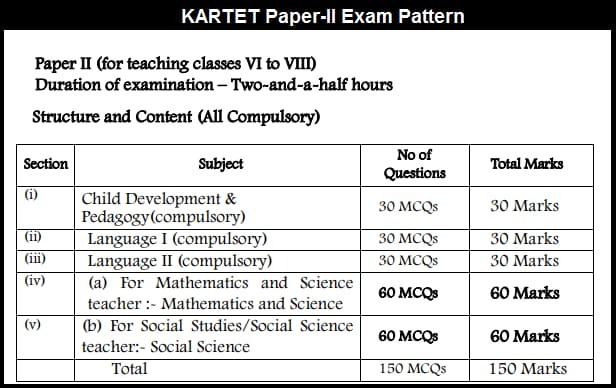 Both the Papers of KarTET i.e One & Two will have 150 MCQs and each question will carry 01 marks. And question paper will be set in English, Hindi, Kannada, Urdu, Tamil, Telugu and Marathi Languages. The Govt. of Karnataka has announced to conduct Karnataka TET Exam for Teachers Eligibility Certificate. Candidates can apply for Paper I / Paper II TET Exam in order to download admit cards. The qualification for becoming a Karnataka Primary & Upper Primary Teacher has been shared in the official notification. An applicant will get time till the date of examination for admission card download and correcting mistakes if any appears on it. After the exam date, the link of admit card download is removed in general. Hence, keep at least one duplicate copy of your TET admission card for future references. The Admit Card Download Link for KAR TET is Available Here. The marks statement will be given to the candidates who appear in KARTET 2019. Candidates who secure 60% and above marks will be issued Karnataka TET Eligibility Certificate. The reserved category candidates who belong to SC/ST/C-I, Differently Abled Persons should achieve a minimum of 55% marks in order to be eligible for the issuance of the certificate.